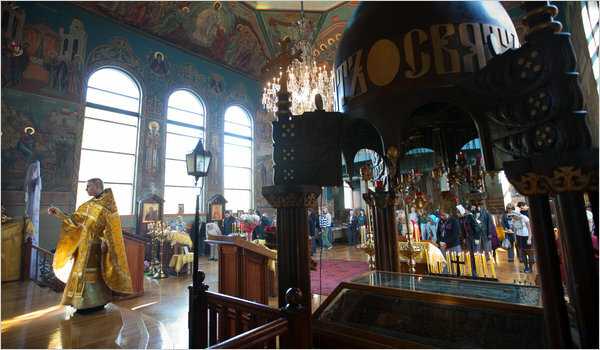 The Orthodox Church of the Holy Trinity has come alive again, due in part to the efforts of the Rev. Vladimir Alexeev. New York’s history is recorded in its desolate churches, where once-packed pews have given way to eerie silence after the children of immigrants followed opportunity beyond the neighborhoods that had defined their parents’ and grandparents’ lives. But the Church of the Holy Trinity may be one that has a happy ending, as its congregation, like the city itself, is refreshed by a new generation of immigrants looking for a new start. The Russian immigrants — many of whom were raised without religion, under a Communist regime — have been enticed back to the old church by a priest who has seen in Holy Trinity a chance to bring both Russian Orthodoxy and a community back to life.